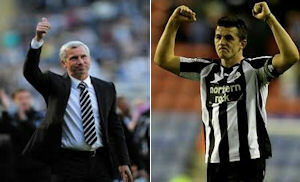 Ashley will not prevent Pardew playing Barton | NUFC Blog. Newcastle United manager Alan Pardew talks about Joey Barton’s potential selection for Saturday’s game against Arsenal and a dispute between the board and players about bonuses. It appears that there will be no further ‘boardroom revenge’ against Joey Barton for his renegade Twitter activities beyond the fine he has already received and that Alan Pardew will have the final say as to whether he plays against Arsenal on Saturday. “Only Joey will determine that. “I’ve said to Joey that he won’t play for me and I won’t include him unless I think he’s pulling for us. He’s in the process of weighing up what he needs to do. Perhaps Joey’s collection of olive branches needs no further additions and maybe a contract is what he was hoping to be offered. Just a thought. Personally, I’d be surprised if Joey does play on Saturday. I doubt his anger at the club’s transfer policies and his own (non-)contract situation has suddenly gone away and I think the only reason he stopped Twittering about it was because of the club’s gagging order on the players. In fact, I’d be surprised if he even makes the bench but I guess we’ll find out tomorrow. “I think it’s very, very important that we all try and build a new understanding. “It’s important that the club and players have agreed there’s something in place to reward you for what you do. “I made it a big priority. It’s important the board and the players are together. At any football club that’s what you need. There has to be a mutual respect. Reports that Alan Pardew is to head to the Middle East to broker peace there too cannot be confirmed. this whole barton situation has me clueless.i have no idea how the club could put him up as a bosman when he’s still on contract and how ashley even Thought of letting go of a player for free. any progress on the replacement for enrique front? and sick of blogging aboot barton and enrique , but waddya fink aboot score on saturday ?? Got Draw 1 – 1 methinks will have to enter the prediction league …! Totally off thread, but was reading a new book yesterday and your name appeared albeit spelled slightly differently. I feel that either you have the same interests as me, or there is something a little more substantial about your Nom-De-Plum. I am perhaps way off line or maybe spot on in my assessment. You may be crafty but I am not if you get my drift. !! Porcie, if you mean Knights Templar, yes I used to read about them a lot. Less so these days. Porciestreet, It wasn’t that book on cider, crockels and body odor remedies was it? I like Joey as a player. I guess an apology and handshakes all round might get him back in the team? We need him when we play the less skilful but more physical teams. Was in his first season stepping up a league. Colo, Nolan & Jonas were awful in their first season with us. Nolan was an EPL player and Colo & Jonas internationals, yet they struggled. New season – new slate? I was looking at the squad and wondering who would be in the 25 this season. If we get a new left back and a centre forward then someone has to drop out. I have assumed that Ranger and Barton have gone but Smith is still around. I cannot recall last years 25 but it would seem a bit risky naming only two keepers. I’m assuming that some of the younger players like Ferguson, Donaldson, Airey, Tavernier etc will not be included. A bit harsh on Ferguson but has young Ameobi put himself in the first team through recent performances. Isn’t there a rule that says players under 20 at the end of the season don’t have to be named in the 25 man squad and can still play? Scott, you are correct. My omission. Apologies. Of the 25 players, eight must be Home Grown players. Clubs may call upon an unlimited number of under 21 players. When people say we have a thin squad I’m assuming they understand the Premier League rules (as clearly I didn’t!). I suppose Ferguson, Donaldson, Airey, Tavernier etc plus Foster can all now be eligible. Looking at the list there are only a few who have no premier league experience. Kamar, I think with keepers there’s some sort of ’emergency protocol’ that allows teams to change their squad if all the named keepers are crocked. has – comical alan – said whether or not he’s (again) been assured from mike that all of the money from this transfer will be reinvested into the playing side of things? or has it (again) been earmarked for more essential maintenance works at the training ground. top of the league in training facilities! we deserve a cup & a spot in europe for this at the least. I’ve hear that Ashley is to spend the money we get for Enrique on a load of those fancy Dyson hand dryers for the bogs. Is it true? A mate of mine blagged a load of them literally off the back of a lorry and he’s been told that they were destined for SJP. Micky the club is already well stocked in the hot air department. Discression has never been my strongest suit mate. Your obviously a PILLAR of society yourself with a name like that. LOL.